My dogs, 2003 to the present- – Dogs On The Ball! The Girls, Abby and Haley– In the first picture Haley is left and Abby, right. Abby and me getting ready to do a Rally demo. Abby and me-my baby girl! My introduction to competitive dog sports was in the 1970’s, when I trained and competed with our family pet at the time, a Great Pyrenees named Heidi. These were what I call “the dark ages” of competitive dog sports, when a happy dog and having fun was not a priority in training, so I moved on. Over the next 20 years or so I went to college, got married, operated a dog grooming business, worked as a licensed veterinary technician, trained horses, and managed our purebred sheep flock with my husband. All the while dogs were my mainstay- I have had dogs in my life since the age of 5. In 2003 it was Abby, our little terrier mix, who brought me back to dog sports when I decided to try what was then the “new” sport of APDT Rally. Wow, the dog sport world had changed so much since the ’70’s! Abby was an exceptional bright light and my teacher in the “new age” of dog training sports (for those of us that are old enough to remember the “dark ages”). Haley joined us later that same year as we took to the new paths of evolving training methods, education and opportunities. I will always treasure those years with Abby and Haley as my time of enlightenment and growth in dog training. From 2003-2013 Abby and Haley competed in a variety of sports including Obedience, Rally, Tricks and Treibball, with a couple of Agility titles along the way as well. Combined, they earned 7 Highs in Trial in Obedience (UKC, CDSP) and Awards of Excellence in all 3 levels of APDT Rally. In 2011 Haley earned the #10 spot in the national rankings of CDSP Utility. In 2012 Abby (at the age of 12 yrs.) earned AKC recognition for being one of the first two All-Americans to earn the AKC Obedience Versatility title (VER). In 2010 we began training Treibball, and in 2012 started participating in the first World Treibball League. In late 2013, Abby (13+ yrs.) and Haley (11 yrs.) both earned their Advanced Trick Dog titles (ATD) through Do More With Your Dog. “Flash“, our Whippet boy. His full AKC name is Shannon Down Color in Lines. Born 10/14/2012 and joined our family on May 31, 2014. 2018- AKC Farm Dog Certified, May 5, 2018 completed the 2 two required tests. 2016- Obedience- TEAM 1-Fenzi TEAM Titles, Level 1 and Pre-2. 2015- Completed NATE Treibball Skills Certification, Level 2 in all 3 categories: Distance, Directionals, and Pushing. April 2017, enter 18 month old “Wilkie”, the “Cirpet”! Wilkie is a cross of Whippet and Cirneco dell Etna. Technically that makes him a “Longdog”, which is defined as a cross of 2 sighthound breeds. 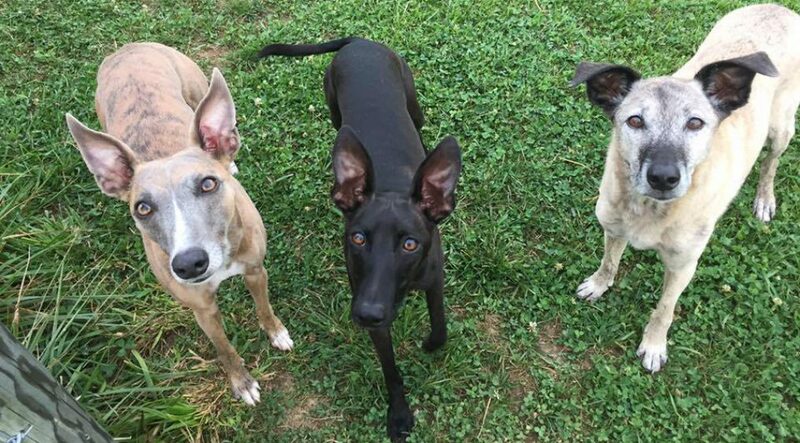 Or a “Lurcher” if you don’t consider the Cirneco as a true sighthound:) Because of his insatiable curiosity, his official AKC name is “Wilkie Wants To Know”. We are just now getting acquainted and will see where his sweet disposition, curiosity and high energy takes us!